There is something breath-taking about being confronted by musical theatre at such close range, especially if the music is of the power and quality to be found in the All Star Productions performance of Maury Yeston and Arthur Kopit’s Phantom. The show was originally designed for Broadway with a £12 million budget in mind, and although it never actually made it there and is currently being performed in a small pub theatre in Walthamstow it still retains the glamour and slick professionalism of a high budget, high profile production. 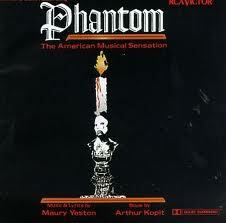 Phantom is inevitably going to invite comparison with the other musical based on the novel by Gaston Leroux, the Andrew Lloyd Webber extravaganza The Phantom of the Opera, which it actually pre-dates. However in fact they are dissimilar enough to make it possible to judge this show on its own not inconsiderable merits. The score, whilst not generally particularly memorable, is enjoyable and has a few striking and hummable numbers. Melody de Paris, which is by way of being the theme tune of the show, is sweet and rather haunting, and the love song You Are Music is incredibly moving. The chorus numbers were entertaining, especially the remarkably choreographed Phantom Fugue, with its dry ice smoke – there is lots of dry ice, be warned! – and swooping lanterns. The choreography was splendid throughout in fact, meaning that despite the large cast and small stage the action never felt crowded or claustrophobic. This is probably thanks to the show’s very experienced Movement Director, Brendan Matthew. The small orchestra performed with brio; such brio in fact that at the beginning it was a little difficult to make out what the characters were singing about, though thankfully that resolved itself very quickly. When kept simple the set was very effective, relying on lighting and some artwork for its sinister atmosphere. Occasionally though it became overcomplicated, leading to chorus members struggling with unwieldy and rather amateurish-looking props which rather detracted from the action onstage. The real joy is the performers themselves. I was delighted to discover that I am still capable of being blown away by the talent to be discovered in pub theatre. The singing is powerful and beautiful, the acting professionally good. The Phantom himself, here portrayed as much less of a pantomime villain and more a flawed, damaged human being, is played with sensitivity and flashes of humour by Kieran Brown, while Kira Morsley’s Christine is endearing and full of life. The subtle improvement in her singing as her lessons progress is cleverly and delicately done. Andrew Rivera is a very believable Cholet with perfect comic timing, and his stage wife Carlotta, played by Pippa Winslow, almost steals the show as the vain, scheming villainess, determined to bring about Christine’s downfall. Her performance of This Place Is Mine, all dramatic facial expressions and strangled vocals is a comedy gem. The chorus, too many to mention, are all superb. Everyone on that stage can sing, dance and act, and they all do so with passion and energy, bringing the tale to vibrant life. Dawn Kalani Cowle’s direction is meticulous; every character has a story and their emotions come across at all times, whether they are the focus of attention or not. Phantom is booking from 14th – 31st May at Ye Olde Rose and Crown Theatre, Tuesday to Saturday 7.30pm and Sunday at 3.30pm.